Financial markets, the banking system, and the real estate, commodity and energy markets have, since 2007, been experiencing higher integration, more volatility and have undergone several shocks. More coordination is needed between G20 and market authorities. 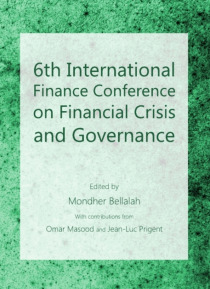 Regulators, banking supervision agencies and politicians are worried about economic growth and financial crisis.This book covers seven aspec… ts related to financial economic issues, along with some connected topics. The first covers risk assessment, corporate governance and value creation through an appropriate risk management system. The second covers international investments, market correlation, institutional holdings and market reactions during crisis. The third part is devoted to empirical and quantitative analysis of the observed economics and finance issues.The fourth part is devoted to the role of debt in financial crisis and its impact on financial markets and the world economy. The fifth part is devoted to debt policy, free cash flows and the structure of governance. The sixth part deals with management control and the importance of communication. The last part covers Islamic finance as an alternative to conventional finance for the debt solution, the importance of the energy sector and the role of financial innovations.